Having fallen down a flight of stairs two days ago, I have spent a good deal of time on my back applying icepacks to a torn thigh muscle. While trying to write in a horizontal position, I realise that I am feeling homesick for Guernsey. I’ve been glancing at a translation of Victor Hugo poems by Harry Guest called (fittingly enough) The distance, The Shadows I bought in a second-hand book store recently. Victor Hugo (1802-85) was exiled on Guernsey between October 1855 and 1870. There is little or nothing explicitly about the island in the Harry Guest translation, but it has made me think about the novel The Toilers on the Sea (Les Travailleurs de la mer pub. 1866 and set in Guernsey). It is very gothic tale, features a titanic struggle with a giant octopus, stormy seas, and has the temerity to suggesting that Guernsey is a rather spooky place. Gilliat lived in Saint Sampson, where he was far from popular. For this there was a reason. In the first place, he lived in a ‘haunted house’. In the country parts of Jersey and Guernsey – sometimes in the towns—you find a house the entrance to which is quite blocked up. Holly-bushes choke the door, whilst ugly planks are nailed across the windows. The glass in the window-frames of the upper storeys has been broken, and the frames look gaunt and hideous. In the back yard, the grass has sprouted up between the stones, and the wall is broken down in many places. If there be a garden, it is overgrown with nettles, and thornbushes; whilst insects of strange appearances about in it. The chimneys are ready to fall, and in palces the roof has given way. The rooms through the shattered casements show a scene of ruin and desolation; the woodwork is worm eaten, and the stone decayed. The paper hangs fromt he wall in strips, one overlapping the other, and disclosing the various periods at which they have been affixed. Long cobwebs, choked with innumerable flies, show the undisturbed empire of generations of spiders. Fragments of broken crockery can be noticed on the shelves. It is not unreasonable to suppose such houses to be haunted; and it is believed that the Prince of Darkness pays them nocturnal visits. Houses resemble those who dwell in them, and can, as it were, die. The breath of superstition is the destruction of the dwelling; then it has a terrible aspect. These weird-looking abodes are not rare in the Channel Islands; all agricultural and seafaring classes have strong faith in the active agency of Satan. Victor Hugo’s octopus with his ‘VH’ initials in its tentacles. Hugo’s depiction of the islanders generally has not been all that enthusiastically endorsed by their descendants. One wonders how close he came to ordinary life. Certainly he amassed a wealth of detail concerning island customs and sea matters by talking to knowledgeable individuals, but this was of the nature of research rather than of first-hand experience. Some of the Guernsey surnames are correct—Tostevin, Mauger, Brouard – but the islanders tend to appear as French Frenchmen rather than as Guernsey Frenchmen, and the unusual combination of French ancestry and English loyalty seems to have baffled him somewhat…. While it can be said with certainty that there was no small degree of superstition in Guernsey at the beginning of the 19th century, it is unfortunate that Hugo gives the impression in his opening chapters that the island was universally riddled with it to the exclusion of every other attitude. It is the opening chapters that I most like, however, and make me feel most homesick. David Shayer was right in that Hugo’s characters are definitely Frenchmen in Guernsey jumpers. If you happen to find yourself in Guernsey, Hauteville House, where Hugo lived, is a fascinating place to visit. This entry was posted in Guernsey, Guernsey Literature, Novels and tagged David Shayer, Les Travailleurs de la mer, The toilers on the sea, Victor Hugo. Bookmark the permalink. Brilliant post – thanks, Peter. 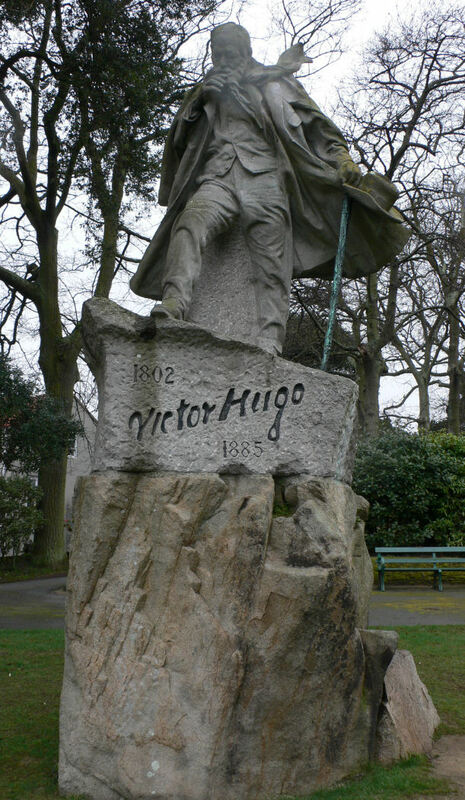 I’d love to have met Victor Hugo! Thank you Marilyn — me too. I’d have liked to dine at his table, maybe next to to the chained chair he kept to remind him of the dead.